This could be it....the last quilt I make for 2016. Still needs some borders. A few hours later and I was to this point...previewing a bigger final border from the original design. Love it! It came together so quickly...just goes to show you sometimes it is so important to let your fabric "age." Counting the days until I go and get the new puppy! In the meantime, you must see how big Eli has gotten. He is such a wonderful cat...only seven months old. He plays great with McKinley...I know he will love having a new puppy too! I spent a great week in Houston with good friends. The quilt show was wonderful...though I feel like every time I go there is less and less to buy or see that is actually related to making quilts. Still...I found a lot of fun stuff to "try." The highlight was meeting Margaret Solomon Gunn and seeing her award winning quilt, "Banquet Royale." Margaret has a great blog and shares so much of her quilting process. She is also a regular writer for Machine Quilting Unlimited Magazine. It was just great to see her quilt and ask her questions. She hand-pieced the hexagon blocks and did quite a bit of hand applique but what sent this quilt over the top for me is her incredible machine quilting. Not a great photo but here is a link to her blog where you can see her wonderful work. On to my shopping finds. I bought a template set to make this quilt which is a paperless way to make blocks that are as accurate as the paper pieced method. The designer has a website, Kits by Carla, where I can view a video should I forget how to do it...since I expect it will take me months...maybe years to try this method. The last time I was at the Houston quilt show I bought the cutest pincushion kit and this time I really had to search for one. This was the winner. Since we had three owls visiting us regularly this summer, this was the kit that spoke to me. 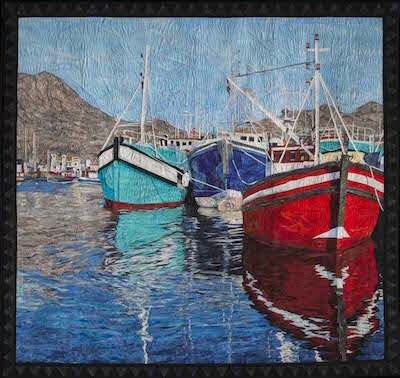 The big winner of the quilt show was Cynthia England with "Reflections of Cape Town." She has a very unique way of paper piecing...kind of a reverse technique as you do it from the front side, not the back. She won the quilt show many years ago and I bought her first book but never tried it. She is the nicest lady...so of course I had to buy her new book. I really need to try this technique! And just for fun, I bought this apron pattern. The model at the show was so darn cute...and I have a pair of old jeans sitting at my sewing machine. While I was flying to and from Houston, I worked on some little redwork ornament blocks. They were even easier to carry and work on than small cross stitch projects. Finally...my first morning home I was drinking coffee with my husband, watching the Pioneer Woman make her stuffed turkey breast recipe. It sent my husband in motion for us to have or Thanksgiving dinner that day. Yipes! My husband leaves tomorrow on a work trip and won't be home until the 29th of November so that is why Thanksgiving came early to our house. Our stuffed turkey breast turned out great and is really perfect for two to four people. Here are a couple of slices we have for leftovers. Here's the link to her recipe for Turkey Roulade. With the Thanksgiving holiday approaching, Breakfast Club for November comes early this month...as in two days from today. I still haven't unpacked from our October meeting. It is that time of year when I always feel like I am behind the power curve. Enjoy the eye candy. If I know the pattern name I will put it above the photo. Gypsy Wife - Warning...no set layout...it took Kathy six hours of math with a pencil and paper to get her layout established. Pattern from the book, " Town Square," by Doug Leko. Runner is called English Fountain. Center block for both table toppers is a panel of wildflower blocks. Hunter Star from the Missouri Star Company. Quilter's World Autumn magazine, "Fall Frolic,"
It was a great Show and Tell session this month. Many ladies were gone last month so it was a treat to catch up with everyone.